This is a bit of a follow-up to my Facebook live stream about goal setting for cystic fibrosis wellness and lifestyle habits! This is relevant to everyone who has goals, not just people with CF, but my fellow CFers will enjoy some specific examples of how I cope with the disease in this post! In case you missed the live, I’ll sum it up. Early this month, I found out my lung function had dropped more than 15% in less than a year. I didn’t have an active infection, but my lung function was consistently dropping to the point that my doctor declared it a Cystic Fibrosis exacerbation (kinda like a “flare up,” but one that needs immediate attention to prevent permanent loss of lung function). Usually, I don’t have to do much for my CF. I have a secret for successfully implementing big lifestyle changes like this. The secret to my successful new lifestyle choices is to use SMART goals to make a solid plan for creating each change in my life. SMART goals are an awesome tool for setting and attaining any goal, and they apply to more than just health and lifestyle changes. I first learned about SMART goals while learning study habits in high school! S - Specific. It’s narrowed down into a small enough goal that you can actually achieve it. For example: “Be successful” is not a specific goal. “Successfully graduate college” is a specific goal. If your goal is vague, you are setting yourself up for failure! M- Measurable. You need to be able to measure your goal so that you know when you’ve met it and when you’re not quite there yet! For example: “Do all of my treatments,” isn’t really a measurable goal. Do four treatments every day is a measurable goal. Either you’ve done all four treatments, or you have not, and it’s easier to hold yourself accountable when you have this standard in place! A- Attainable. Now, I’m a huge fan of dreaming big and not limiting yourself when it comes to plans for the future and dreams in life… but I also think it’s really important to make sure you don’t set yourself up for failure. For example, if I have $800 extra in my budget each month when I don’t overspend, eat out, buy birthday gifts for someone, etc… then my main goal could be to save $600 per month. That’s an attainable goal. Then, if I want to really push myself because I’m saving for something special, I can set a stretch goal to save the full $800 extra (or even to find a way to earn an extra $100 so that I could save $900 that month)! That way, I’m not set up for failure, I’m not crushing my ambitions, and I have a solid way to hold myself accountable for the main goal I want to accomplish. R- Relevant. You want your goal to be relevant to your priorities and values, otherwise… it’ll be tough to stick to it! The first time you have an excuse to jump off the train, you want to make sure you know WHY you’re doing what you’re doing so you can stick with it! For example, if you love reading, you are a student and work in an office, and you think you’d like to learn to write… but you’ve never really had a passion for writing and there’s nothing in particular you want to write about… setting a goal to write a book in 60 days wouldn’t exactly make sense, and you probably wouldn’t finish! But if you set a goal to read two books in the next 60 days, as someone who loves reading, that makes a lot of sense! Or to earn a certain number of credits within the next semester- that would make sense because you are a student and obviously working toward your graduation. A relevant goal is much easier to stick to. For example, in the previous example I mentioned the possible goal of writing a book! To say you want to write a book is pretty cool and it sounds like a nice goal… but if you just say that you want to write a book… it’s probably not going to happen! You’ll want to put a time-frame on that book so that you actually get to work on it and keep pushing to finish it! Wanting to finish outlining a book in 30 days, for example, is a clear time-bound goal! Another way to use time for your goals is to set the amount of time you want to do the thing for. When you’re building a habit, 21-90 days is a good range to start out with. So, now you know what SMART goals are! You can set yourself up for success every time you want to start a new routine, set a new habit in place, or reach a new goal! 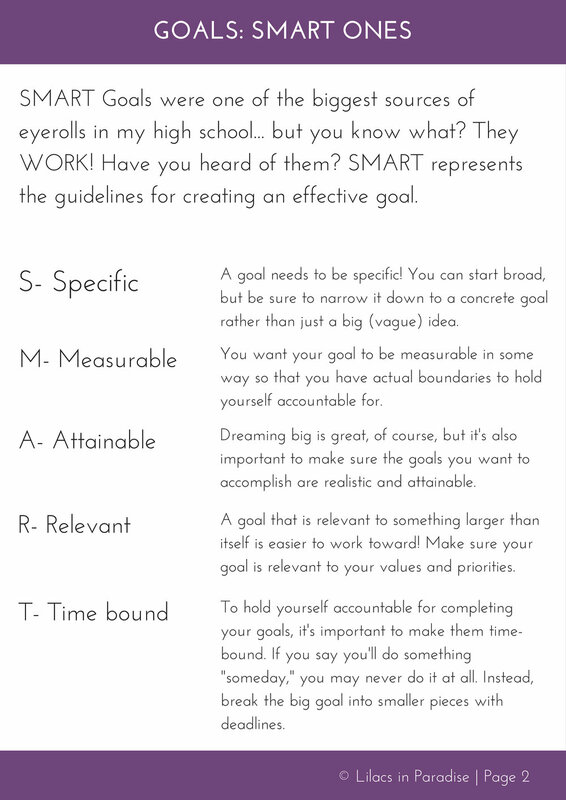 At the end of this post I’m going to share a printable worksheet you can use to set your own SMART goals! Before we dive in though, I want to give you a couple examples of how I turned those CF lifestyle changes I mentioned earlier into SMART goals and daily habits! You also need to plan your action steps! It takes action to bring goals to life, right? With your SMART goal, you set a powerful intention and found ways to hold yourself accountable. Once you’ve written out your goal, it’s time to break down the action steps it will take to make it happen. M: Do a minimum of 3 breathing treatments per day. A: This is an attainable goal because I have plenty of time to do these treatments and I have access to the meds and equipment I need. R: I know this goal is relevant because my lung function is important to me! T: I will do a minimum of 3 breathing treatments per day for the next 21 days. Barriers to this goal might include running out of medication and forgetting to order more, forgetting to do my treatments, and feeling super unmotivated and finding excuses not to do them. To prevent myself from running out of meds, I’m setting an alert on my phone for 1 week before I run out so I will remember to order more with plenty of time for them to arrive. To prevent myself from forgetting treatments, I’m tying them into a daily habit I already have (this works so well!!). I’m going to do a treatment before every meal and I will try to also do one before bed. This way I’m hitting my minimum goal of 3 per day, but I’m giving myself the opportunity to reach my bigger goal of getting all 4 in! To combat motivation issues, I’m pinning my note from my doctor somewhere I will see it every day! I’m also journaling about 1) how sick I feel on day ONE before starting these new habit and 2) sharing in my journal about how the feeling improves as I continue to stick to my goal. Create an incentive for yourself! For me, this looks like an extra boba tea or visit to the coffee shop just to celebrate reaching my goal- and I totally tell the barista what I’m celebrating when she asks what I’m up to that day. It always feels good to celebrate a bit! Other incentives I’ve used include going swimming, visiting friends out of town, going for a road trip, buying a new book, calling up my grandpa just to tell him the cool thing I accomplished and celebrate with him, buying new crystals, redecorating a room in the house… there are all kinds of ways to motivate yourself. Get creative, and don’t skimp on the celebration of reaching your goals! first of all you are the real MVP! and I’m super proud of you for being this dedicated to reaching your goal. Second, I have a treat for you. 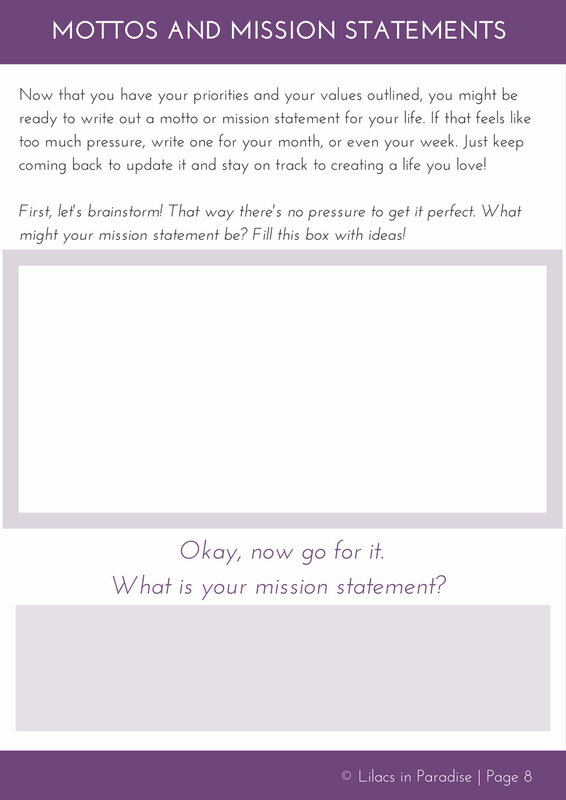 I want to invite you to use this printable workbook for setting goals! There’s a sheet dedicated to SMART goals, and a few other pages you might enjoy as well. 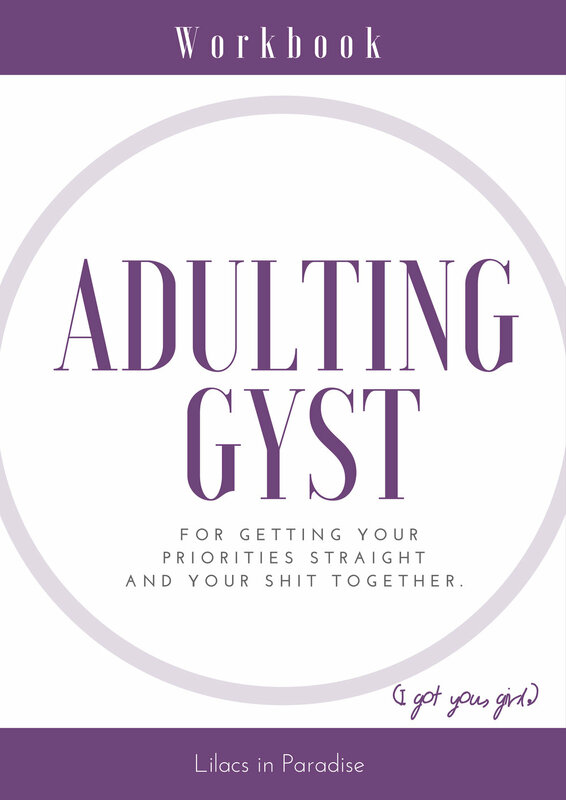 It’s the Adulting GYST workbook and it’s actually a lot of fun! Click here to download and print your workbook! Let me know which of these tips has been your favorite or if you have any tips of your own for people starting to set big goals in their lives and implement healthy habits! P.S. Want to save those SMART goals? Here’s an infographic you can download, share, and save to Pinterest! I hope this has been helpful! Let me know what you need more of or what you loved best in the comments below!